Warm 60 degree days have been kept to a minimum so far this icy, cold winter of 2014. After 3-4 weeks of constant polar plunge waves of cold air, we finally caught a break this weekend. It won’t last long though as the biggest snowfall of the winter is only a few days away. While we have some sunshine and warmth, I made out like a bandit to see some waterfalls. My choice today was a new one for me, Little Bradley Falls. 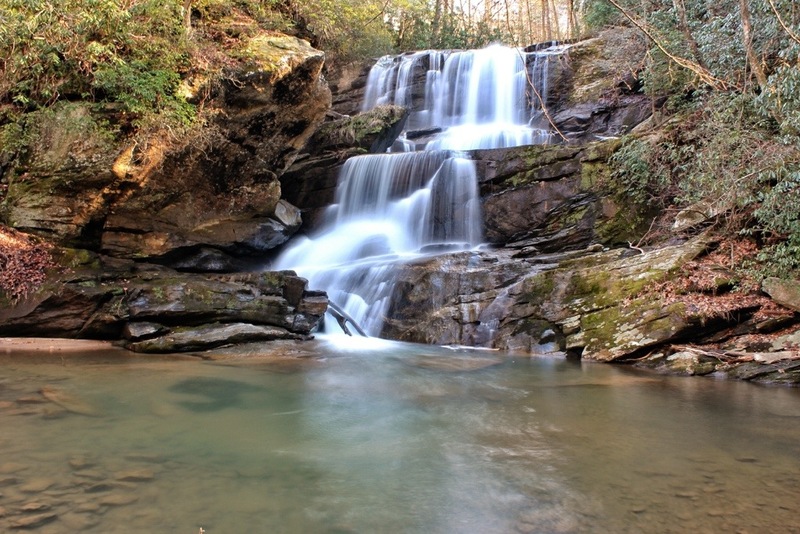 Little Bradley Falls is located near Saluda, NC . To find this location: From exit 59 on I-26, take Holbert Cove Rd for 3 miles or so. When the road begins curving frequently downhill, you’re close. At the bottom of the hill, the road crosses Cove Creek. There is parking on the left before the bridge, and on the right after the bridge. There are trails leading from each side of the road here, and the one on the left leads to Big Bradley Falls downstream, another waterfall for another day. The trail for Little Bradley Falls will be the one on the right. My goal today, for a second time, was to see Little Bradley Falls, the 35 foot multi-tiered waterfall, upstream from the road. My first attempt was in the summer of 2012. I followed the directions just as they read, or so I thought. There is a decision immediately to make once you start this hike. One trail follows the creek upstream, and another one goes more to the left, uphill. The uphill trail is the one to take as the other one will dead end in just a few hundred feet. The initial climb is fairly short, and in just a few minutes, another decision time will present itself. As it turns out, this is where I failed the first time. I read the directions better this time, and took the right trail. This is the one that crosses the little feeder stream and makes it’s way back to the main Cove Creek, following it on the left side. 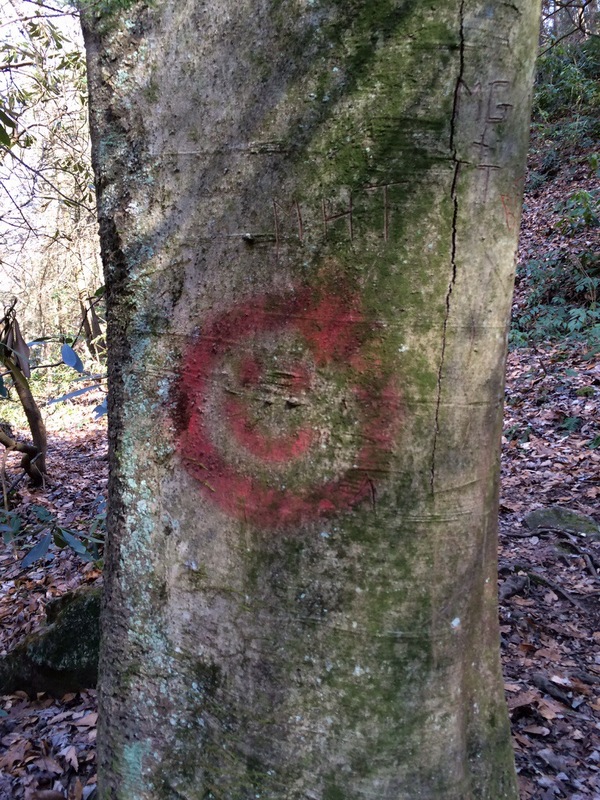 This trail is marked with red markings on the trees, and and never strays too far from Holbert Cove Road, now way up the steep hill on the right. Follow theses red marks, and you will find Little Bradley Falls. Do not make my first mistake. This trail is in good condition for the most part. There are a few fallen trees to walk under or over, but nothing terrible. I do not know who is responsible for maintaining this trail and marking the trees, but they have done a nice job. 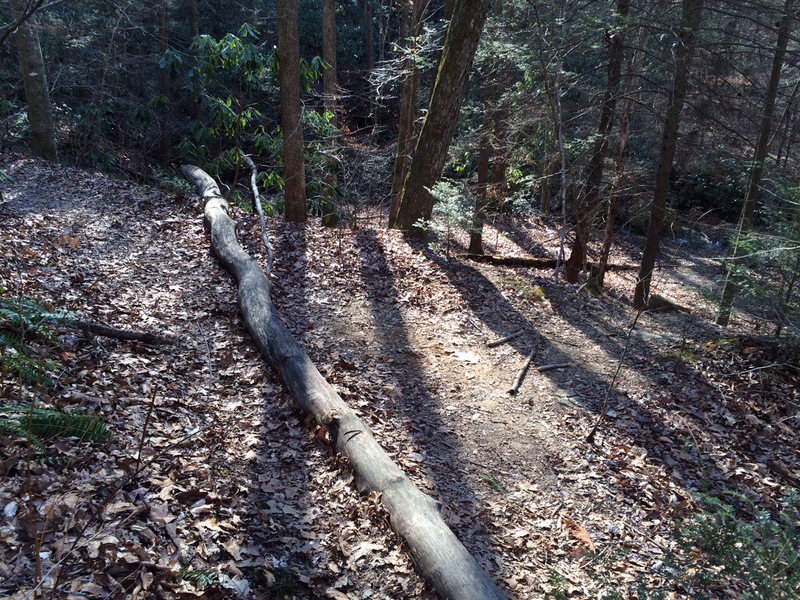 It is obvious that it is not an official trail maintained by the state. If it was, the next scenario would not have occurred. Cove Creek is a fairly wide creek. The water seemed to be about a normal flow on this winter day. There is a point where the trail crosses it about halfway there. 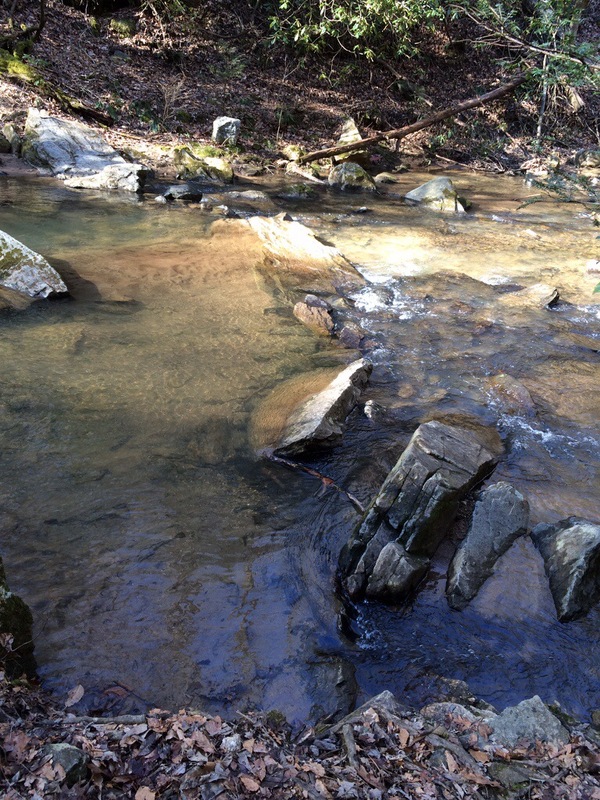 With numerous rocks in the stream, it seems rock hopping would be an option. Waterfall Rich mentioned in his blog at http://www.ncwaterfalls.com that you would most likely be getting your feet wet here. He was right. I looked up and down the stream here and picked my crossing that I believed I had the best chance to cross dry. As I tried to make one step into the water and one back out, the slippery stream bed caught me and instead of a wet foot, I was soaked from the knees down. I got up, said a word or two that I should not have and moved on. At least my camera bag was nice and dry still. A bridge would be nice here. Sloshing upstream, I just focused on finding Little Bradley Falls and not on the hurdles that this trail seems to keep throwing at me. After a tricky rock crossing , the waterfall soon appears. 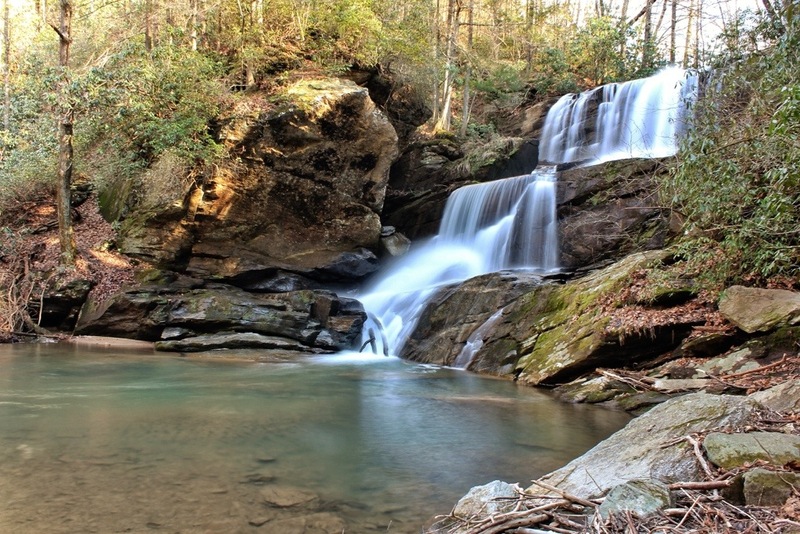 This waterfall is gorgeous, and suddenly all is forgotten and forgiven… There are numerous places to stretch out and enjoy this picturesque waterfall and large wading pool. After some time here, I asked a group of 4 kids that were just behind me most of the way if they were able to make it accross dry. They just kind of laughed at me and said that they have been here before and pointed at their sandals. What was I thinking? Just a week ago it had been in the single digits with Ice Falls everywhere. The seasons sure change quick in North Carolina. I was determined not to make the same mistake going back. I also was not ready to get my feet wet again. On this side of the creek, I did see a few short uphill tracks that led straight to the Holbert Cove Road above. I came to a fairly clear path to the top, and took it. This was another mistake. The steepness and the tons of dry leaves made this climb very difficult. Luckily, it is a short climb out, and I made my way back to my vehicle via the road. The moral of this story, is that if you come to visit Little Bradley Falls, just follow the red-marked trees, plan on getting your feet wet, and have a good time. This is a beautiful falls too. 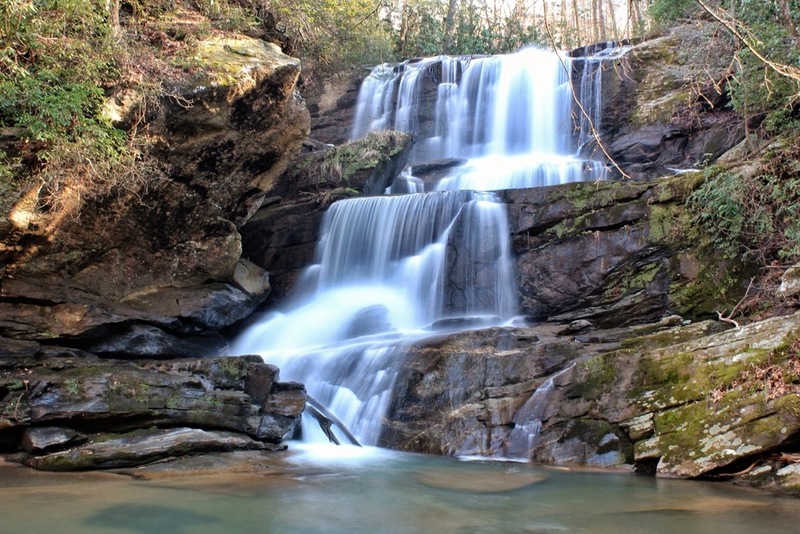 Do you know about the falls on White Oak Mtn overlooking Columbus? It has a long Indian name and right on side of road. Gene, I believe you are talking about Skunkawauken Falls. I did visit that early this year on the same day I visited Little Bradley Falls. The road getting up there was…interesting. We are going tomorrow with my 77 year young mother,I say this because she climbed all 500 steps up chimney rock and also hiked to falls at gorge at 75,thanks for all the information! My great-uncle Bradley was born in Saluda. How did Bradley Falls acquire its name? My Bradley family (7 generations, begun by Richard Bradley) had summer home in Saluda (I have pic of house, also of young Bradley on lawn) from late 1800s, primary home in Wilmington NC. 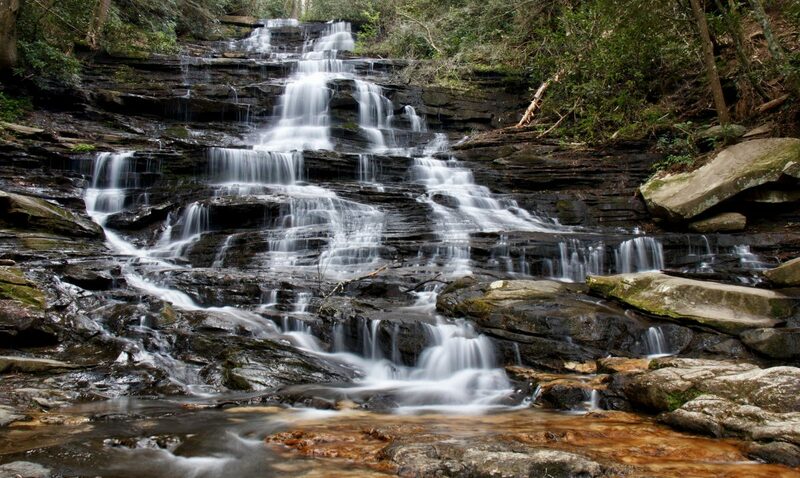 Would love to know more about all the Bradley Falls in area.